The Full Calendar chronograph with moonphase is the top model of the Pharo family. The 40,5mm ICKLER steel case - made of polished stainless steel - impresses with its elegant cannelage. The Swiss made chronograph movement Eta 7751 TOP can be seen through the sapphire display back. 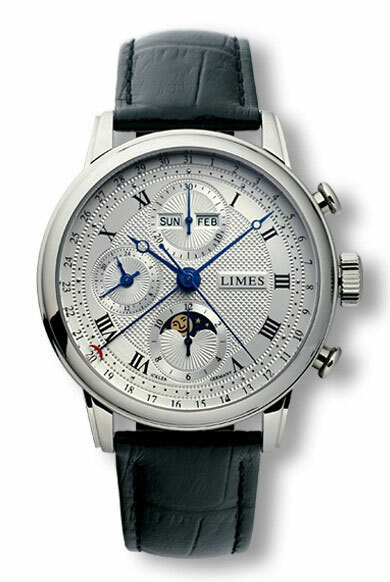 The precise dial impresses with its fine Clous-de-Paris Guilloch pattern. The elegant Sunray-Guilloch patterns on the three subdials and the blue Breguet-hands complement this valuable appearance. This item ships to USA and Canada..